James Webber was 25 years old when he arrived in Sydney on the Minstrel in January 1822. He carried a letter from the British Colonial Office strongly recommending him to the Governor of NSW and instructing he be given a grant of land. Within weeks of landing in Sydney James Webber travelled via Newcastle to Paterson's Plains where he selected 1,500 acres of land which was to form the core of his Tocal estate. The land he selected was part of the ancestral home of the Wonnarua Aboriginal People. The Wonnarua called the area 'Tucal' or 'Tugal' meaning 'big' or 'plenty', probably because of the abundance of wildlife, fish and plants found there. In accordance with Colonial regulations, the 1,500 acres were granted to James Webber on the condition he maintain 15 convicts on the land at his own expense. 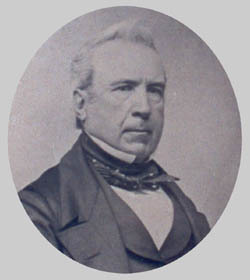 Above right: James Webber aged about 73. Photo courtesy of Mr Sega of La Maddalena, Italy. James Webber wasted no time in moving onto Tocal. In March 1822 he sailed from Sydney to Newcastle on the Elizabeth Henrietta with four convict servants and six tons of baggage and equipment. Three of the four convicts had been transported for stealing - John Waggoner was aged 19 with a life sentence while James Hazell, aged 20, and Stephen Hover, aged 31, had seven year sentences . 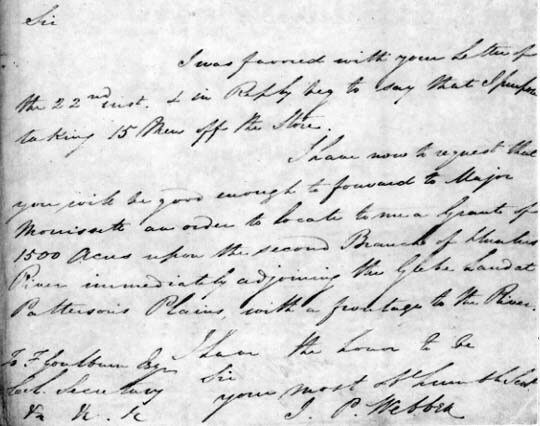 Above: part of a letter written by James Webber at Newcastle on 31 January 1822 requesting 1,500 acres at Paterson's Plains and agreeing to support 15 convicts.